Harrington and Richardson may not be the best known firearm manufacturer around but they are by no means new to the industry. Since H&R’s beginnings in 1871 they have been well known for high quality firearms. H&R is probably best known for their single shot rifles. If you are using it to hunt, you better make the first shot count. The Handi-Rifle on the bench is the SB2 chambered in 44 magnum and outfitted with a BSA 3-9×40 scope. This Handi-Rifle sports a synthetic stock but many H&R guns come with traditional wooden furniture. The rifle is heavy enough to make it a sturdy shooting platform but light enough that you don’t feel like you’re carrying an artillery piece. The gun has a nice feel to it when you get into firing position and seemed to snuggle into your shoulder area rather nicely. The molded in checkering helps you get a grip on the gun with ease. Personally when shooting from a rest I prefer shooting without gripping the forearm. Once acquainted with the gun I pushed the release to open the breech, loaded a round and pulled the hammer back. I peered through the scope lined up the cross hairs and squeezed the trigger. Low and right of center was the result. Being that it was friend’s rifle I knew it would be unlikely to be dead on for me. A couple of more shots to make sure that it was the difference in shooters that had the shots off-center confirmed that the grouping was there. With a little strategy in aiming high and left consistently grouped the following shots in the center. The recoil of the rifle was enough to let you know that it was there but remained comfortable throughout the shooting session. 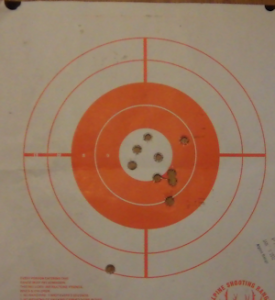 My 13 year old daughter even got behind the rifle and took a shot. The recoil did not bother her; it was the amount of BOOM that she didn’t like. If you are looking for a rifle for precision shooting or the sought after one shot one kill hunting experience then you might want to take a look at the Handi-Rifle line. In case the 44 magnum is not what you are looking for you can always look at the other calibers H&R offers. Calibers range from 22-250 to 500 S&W. The only hard decision would be which one to get.